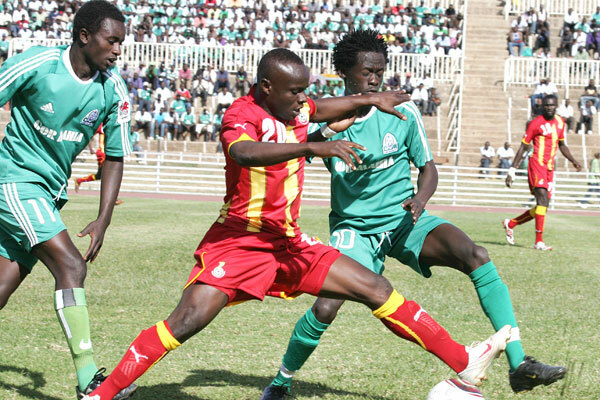 The year started on a bright note with Kogalo beating the Ghanaian national team 2-1. New signing Ezekiel Odera looked like he was going to step right into Blackberry’s shoes when he scored the match opener against the Ghanaians with Collins Okoth scoring the other. Speaking of Blackberry, Gor Mahia had just bid farewell to him after a short but stelllar career which ended with him being named footballer of the year and one of the 100 most promising players by the website goal.com. But Kogalo fans euphoria soon hit the ground with a thud. It came when they went down 0-3 to Rangers FC. Some Fans reacted by disrupting the match with a hail of stones leading Supersport with no option but to ban Kogalo matches from being televised. A second fracas happened in the top 8 match against Ulinzi when Kogalo fans protesting poor officiating went on rampage causing damage worth close to KSH 1 million at Nyayo stadium. Kogalo were then disqualified from the Super 8. On the field, Gor Mahia were slowly recovering after a slow start. New signing Moses Odhiambo aka “Lucky Dube” proved his mettle by scoring several crucial goes. Most notable was his superb freekick against Thika United at City stadium. Odhiambo’s rise was most welcome because some of the youngstars who had shone previously were not in the same form. Most notable was “Teddy” Akumu whose loss of form was inexplicable. Perhaps he was demoralized at not being selected by Randers FC of Denmark after he attended trials. Meanwhile the other new signing Ezekiel Odera who had shone brilliantly for KCB in 2010 was having a tougher time finding his footing. All in all he scored only one goal in the first leg of the league. His sudden loss of form is not easy to explain either. Maybe he was unable to function well in the system of long balls that Zico had started to introduce. Or maybe he is one of those players who can only thrive when playing for a team without demanding fans, much like David Odhiambo “Deo” who was the league top scorer when he played for Re-Union but could hardly play when he joined Kogalo in 1992. Gor Mahia soon recovered to record critical wins over defending champions Ulinzi, Stima and others. The month of March was highlighted by a tour from the U-23 side of Brazilian outfit. Kogalo outplayed the Brazilians and outbraziled them. In the end Palmeiras won 2-1 and their captain had some words of advice “Playing beautiful football means nothing if you do not score”. Telling words especially since they are coming from a Brazilian. The nation known for “Jogo bonito”. Another high water mark for the club came in the month of April when they landed a landmark sponsorship from Tuzo milk thanks to the diligent efforts of Chairman Ambrose Rachier and his team. At the time it was the most lucrative deal signed by the team. New jerseys were unveiled and that was when some sourness regarding the sponsorship appeared with many fans faulting the fact that Kogalo only got 10% of the proceeds of jersey sales. As the first leg ended, Gor Mahia’s unsatisfactory form neccesitated some changes. Out went fan favourite Ibrahim Kitawi who joined Tusker. In came Demonde Selenga, Wycliff Ochomo and Moses Otieno. Gor Mahia were in fine form midway through the year. Most memorable was the 3-1 win over arch rivals AFC Leopards that sent fans spriralling into the sky with joy. Demonde Selenga made a dream debut scoring within minutes of coming on as a substitute. Wycliff Ochomo had also scored the first goal in what was his first game for Kogalo. Dan Makori rounded up the score. But soon cracks started to appear. The club despite having beaten AFC 3-1 were not particularly playing well. Trouble really started when they lost to SoNy 0-1. Matters came to a head when Kogalo lost to bottom club Congo United in the FKL cup match. Player morale seemed to have nosedived. A reprieve however saw Gor Mahia stay in the competition as the best looser, much to the chagrin of other KPL teams. The low point of the entire season came when they lost 0-3 to arch rivals Ingwe. By then disillusioned fans had started to abandon the team. Others accosted club officials including coach Zedekiah Otieno. The loss while not unexpected was sobering. When Kogalo lost to Bandari on a rain soaked Mbaraki pitch, there seemed to be no respite. Even replacing coach Zico with his assistant Anaba Awono did not seem to remedy the situation. Chairman Rachier meanwhile was blaming Mohammed Hatimy for sabotaging the team to discredit Rachier as a candidate for the FKL chairmanship. So when Gor Mahia were pitted against AFC only 2 weeks after loosing 0-3, no one expected them to win. AFC fans were certain of victory. The match was the semi final of the FKF cup. But a superb header from Moses Odhiambo sent the aspirations of AFC fans crashing. It came after a superbly floated freekick by Moses Otieno. Irate AFC fans who expected a repeat victory were in disbilief and resorted to causing the abandonment of the match which was then awarded to Kogalo. That win was the high water mark of the season for the team. It marked the end of a long spell of poor results. It marked a rising of the ashes of a team that had all but been eliminated from the FKF cup and written off by pundits. A week later Gor Mahia overcame a tough Sofapaka side at the city stadium, winning 1-0. They thus booked a ticket to play in the 2012 Confederations cup, sparking massive celebrations at the city stadium. The all important goal came from the fleet footed Edwin Lavatsa following a right wing cross from Dan Makori. Gor Mahia ended the season on a sound note, earning revenge wins over SoNy Sugar and most notably Rangers. They finished 4th in the league. As the league ended. the club held its annual general meeting, ushering in a new office. Ambrose Rachier retained his post as Chairman. However most of the rest of the previous officers fell by the wayside. Other positives for the team were the emergence of certain players. Eric Masika had a good year. Moses Otieno who was misused at Tusker became a solid player at Kogalo. Moses Odhiambo scored several crucial goals. There was some regression with players like Musa Mohammed, Anthony Akumu and to a lesser extent Kevin Omondi who lost his place in the national team. Jerim Onyango in goal had an up and down year. All in all , the fans a have a look to look forward to in 2012. Anaba Awono has brought back a modicum of the swift attacking football that Kogalo had become famous for. The arrival of Rama Salim and Ivo Mapunda amongs others will shore up some of the weaknesses. The team has retained Ezekiel Odera. Hopefully Anaba Awono will find a formula to make him successful. Odera is clearly a good player. And there are signs that “Teddy” is slowly regaining his form. Defensive stalwart Eric Masika has departed but Kogalo will march forward as usual. I juz hope lavasta will put up more effort come next season! He is a talented goal scorer! Selenge should play wide! Forever kogalo! Well written Admin. I thought Odera is on his way out though I wish he remains. With him and the likes of Kitawi and Lavatsa we can again have that beautifull soccer which seemed to be elusive last season. With Ivo, Rama, Owino, Hugo ,Juma and hopefully the Rwandese striker I believe we will have the depth that is required to win the league and at the same time be competitive. What we should not forget is also to have some upcoming players in the fold. We also need to sign a right back. With Yussuf Juma at left back we have signed wisely. Then let’s crown the signings with Kagire from APR. Kogalo shud then go on and win the KPL title in 2012 and go very far in the confed Cup. -With the game surely heading for a stalemate and the visitors employing frustrating time wasting techniques,kevin omondis’ delightful chip over francis ochieng in the soldier’s goal won it for us,with what was almost the last kick of the match. -Lavatsa’s strike againts sofapaka that propelled us back to africa(fkf final). -Making ingwe chase shadows when we beat them 3-1 in the first leg ,and then shocking them in the fkl semis. -Gattusso’s goal againts karuturi at city.The goal itself was a marvel to watch(great bicycle kick)but the circumstances under which it was scored?99thmin,while there were only 6mins of time added on. -1st match of the season againts rangers. -efussi fans disrupting the fkl semis and hittting masika with a missile. -the bhang smokers and madmen of luanda stoning our fans. (according to statistics from the ministry of public health and sanitation,luanda market has the highest concentration of madmen/women and bhang smokers in the country). @arrumtiddi, there was nothing bad with the game going upto 99 minutes. We have even seen in EPL where Manu matches extended by 10 minutes. So can you tell the whole world what was bad with the goal? Gor is a big team just like Manu in EPL. The article is excellent piece of art work. My hope is that just like SS have built their brand locally let’s also try all we can to strengthen the GM brand. The cases of hoologanism really hurt our image. I believe/hope we will not have reasons/excuses to do some of those brand-crashing things next year. On the playing unit recruitment i’m pleased with the mix. To win and maintain our form we have to look both inside and outside. Currently the playing unit is very representative of the face of kenya and that’s the way to go. While our Shemejis are going very local with their recrutment we are trying to get the best from all corners of East Africa and hence spreading our support base outside our borders. Kudos to all for the support you gave the team last year and remember that this year that support will be needed like never before, both financially and morally. @pareyio ole lelerue, this time am in total agreement with you. I do not agree with no 3 undue pressure, Gor Mahia being a big club; we should expect undue pressure to continue and this is the beauty of the game.